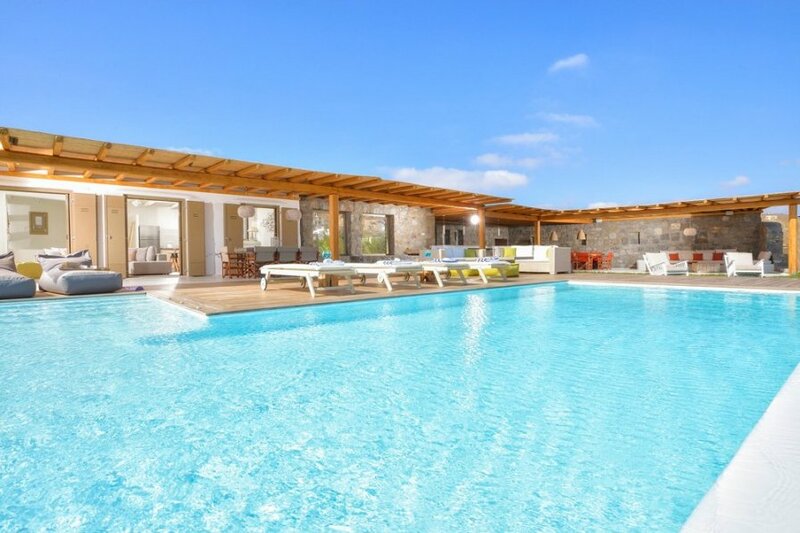 Villa Alelia holds a wonderful position just above Elia Beach on the south coast of the beautiful island of Mykonos. Elia beach is not only the island's longest beach. Villa Alelia holds a wonderful position just above Elia Beach on the south coast of the beautiful island of Mykonos. Elia beach is not only the island's longest beach, it is regarded as one of the best with its picturesque scenery, sparkling turquoise sea and handful of tavernas and beach bars serving local delicacies, as a result it is consistently awarded the Blue Flag status. For those looking for a little more hustle & bustle, picture-postcard Mykonos Town itself is just a 20-minute drive away. If you can drag yourself away from the beach, the narrow streets of Mykonos town are bursting with restaurants and boutiques to explore, while evenings can be spent enjoying the excellent nightlife! The stylish and spacious villa has been designed in a contemporary, minimal style and can sleep up to eight guests across four beautiful bedrooms. On the upper level is the main living accommodation which comprises of an open-plan living and dining area and a kitchen complete with all necessary modern amenities. On the lower level, there are two king-size double bedrooms, each boasting patio doors leading to private terraces as well as luxury en-suite bathrooms with impressive “rain” showers. Also, on this level is a further oversized king-size double bedroom as well as a final twin bedroom, again both of these bedrooms have access to private terraces and share a family bathroom. Outside, the infinity-style private pool has the real wow factor and is the perfect spot from which to admire the spectacular views over the bay below. There are multiple dining areas complete with barbecue which is perfect for al fresco dining on a summers afternoon under the shade of the modern pergola while a cool drink can be enjoyed from the comfort of the pool bar. Fashionable Elia beach is not only the island's longest beach, it is regarded as one of the best with its picturesque scenery, sparkling turquoise sea and handful of tavernas and beach bars serving local delicacies, as a result it is consistently awarded the Blue Flag status. For those looking for a little more hustle & bustle, picture-postcard Mykonos Town itself is just a 20-minute drive away. Mykonos Airport is also conveniantly located just over 20 minutes away.